How do I know that I will pass my Real Estate Exam using NightBeforeTheExam.com? Our real estate exam prep programs have an advanced, built in mechanism that will track your level of progression. Over time, our 'Competency Meters' will dynamically adjust based on your performances during our simulated exams. These meters will indicate your competency level in each specific exam topic category, allowing you to visually see where you need to focus your study time. Although not infallible, our 'Competency Meters' are a great tool to help you determine your level of preparedness for the real estate exam. No Real Estate exam prep program is a magic pill, therefore, based on your current level of knowledge, some serious study may be required. 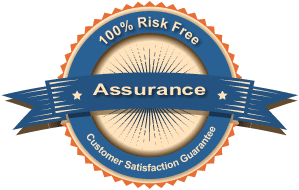 Do not waste your time on fake guarantees with unrealistic time constraints attached to them. Rather, make use of truly helpful (and fun) tools that are designed to raise your level of preparedness so you can pass the real estate exam the first time, with confidence. Users of NightBeforeTheExam.com enjoy more than just simple questions and answers; they also have additional tools available to them, such as our animated instruction videos (we call them Toon-Torials) and our power packed Cheat Sheets which are dynamically generated based off your examination weaknesses. Together with our risk free guarantee, these tools provide for you the absolute best and easiest to use real estate exam help available, especially if you are short on time. Do you have the actual word-for-word questions from the real exam? I think I saw another site claim to have the "actual exam questions" - is this true? Sorry, but the real questions are protected by law and no preparation product has the actual word-for-word questions. It is more likely that the site you saw noted that they had "actual exam questions"... It's the equivalent of a hot dog stand saying, "we have actual hot dogs". Well gosh, we would hope so! The test of a quality exam preparation product is whether or not the material provided is truly helpful in learning the real estate exam concepts sufficiently enough to pass the actual exam, regardless how the questions are worded. At NightBeforeTheExam.com, we know the exam topics you will best tested on, and our material developed based on those topics and delivered to you. Therefore, whether your State uses PSI Exams, Pearson Vue, or AMP as a testing company, you will learn these important concepts using our detailed (and easy to follow) help files that are included with each practice question. Enjoy our pain free method of test preparation that is presented in a format similar to the actual exam you will face. What is the Dumb Ox Engine? Unique (and honestly) revolutionary. It's a system that learns from you and helps you make the most of your study time. That is what the Dumb Ox engine is. This is in contrast to other, more expensive, learning systems that present static material, in a linear, progressive difficulty track. In other words, most learning systems have a set amount of practice exams that will be given to you in a set order, each exam labeled more difficult than the last. The disadvantage to these other learning systems is that they don't adjust to you, a unique individual. These inferior static learning systems treat everyone as if we are all at the same level of expertise, and that we all agree on what is considered difficult or easy. The Dumb Ox Engine is truly one-of-a-kind and was created from the ground up to be incredibly accessible and helpful to all test takers, even to the common Joes and Janes. The simple and straight forward Dumb Ox quiz engine does something that books and other websites can't do, i.e. interacts and adjusts to you individually. The Dumb Ox Engine dynamically adjusts the content you receive based on your ongoing weaknesses and strengths. It will track your progress and give you more challenging questions based upon your past performance. It can even create a custom legal sized cheat sheet for you based on the exam topics you struggle with the most. It is an exam prep learning system that respects your time by maximizing the effectiveness of the time you spend studying. It was created for the common person, the individual, and it is quite possibly the most fun you will ever have studying, if there is such a thing... and we say there is. 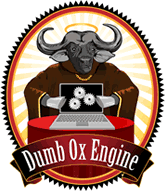 What's up with the name, Dumb Ox? Have you ever met a bald guy named Curly? Or perhaps a large fellow called tiny? It is a lot like that. Imagine, if you will, you are sitting in a university classroom almost 800 years ago and there in the corner sits an oafish young man, with a monstrous chest like a wine barrel topped with a massive balding head with intense facial features. Day after day he sits in the corner silent, perhaps even a little reserved. Your fellow classmates begin to proclaim him as a dunce and after a time he acquires the nickname "Dumb Ox". Yet, in time, history would record this brilliant Dumb Ox as one of the greatest minds and western philosophers whom had ever lived. This massive beast of a man is known today as the great Thomas Aquinas, he was someone who built his life on asking questions and answering them authoritatively. Our company philosophy has always been that anybody can learn and anybody can be taught... and anybody... even those who are labeled as being dumb as an ox, can be great. We all have a tremendous amount of potential that just needs to be tapped. Exactly what will I get after I click the "Get Started" button? - Fun, effective, and easy to use exam simulation program. - Detailed help files. Step-by-step solutions for math problems. Easy to understand explanations for key concepts. - Printable Legal Sized Cheat Sheets specially created based on your weak areas. - ToonTorials "10 Things To Do (or know) Before Taking The Exam" and "What To Do If You Do Not Know The Answer". - Study from multiple locations (e.g. home, work, etc.) using your Internet connected PC or MAC. - Fun and Informative Crossword Game. - Easy to understand Real Estate Glossary. Everything here looks great. Please tell me about your company. As a company, we have been providing computerized exam preparation since 1999. Everyone involved with NightBeforeTheExam.com has been in the real estate business for at least a decade and we all understand what it is like to have to worry about the advancement of your career. It is our #1 priority to keep you happy and to help you pass your real estate exam in the most pain free way possible. In can be a very daunting task trying to find reliable resources to help you pass this very important exam. Please feel at ease here. We have made every effort to make your experience here enjoyable. From industry standard security, excellent customer service, and fun and informative material, you really can't go wrong. In fact, with our low price point and risk free guarantee, this very well may be one of the most satisfying experience you have had with a purchase on the Internet. If you ever have any questions or concerns, please don't hesitate in contacting us. Please explain your Risk Free Refund Policy. It is our #1 goal to make sure all of our customers are pleased with their purchase. We are confident our exam preparation material will be beneficial to you, therefore, feel free to use our material risk free for 24 hours. If, within the 24 hours, you do not feel you got your money's worth, we will refund 100% of your money back - guaranteed. Because we offer content that can be immediately useful to our customers (cram sessions etc. ), we do not generally offer refunds to individuals that have had a membership for longer than 24 hours. With this in mind, however, customer satisfaction is still important to us. Therefore, even after 24 hours, we will consider all reasonable requests for refunds on a case-by-case basis. We invite you to take advantage of our risk free policy and try out our program. You have absolutely nothing to lose, yet an excellent test preparation program to gain. This is a one time investment of only $59.95 and you will receive immediate online access to our real estate test preparation material for a full 90 days. We understand we have customers that begin preparing for their exam earlier than 90 days out (good for you). Therefore, if you need more than 90 days to study, just ask and we will make arrangements. You can get up to 1 year of access without question, and we can even offer more under special circumstances. Again, customer satisfaction is important to us, so it is our goal to make sure you can access our materials for as long as you need to pass your exam - free of any additional charge. Please explain your Pass Guarantee Policy. *You may take the simulated exams as often as you like to get your competency meters up. The competency meters will indicate if you are poor, weak or good in each of the exam topics. These meters are very accurate in demonstrating your chances of passing the actual exam, and are a great tool to help you better manage your study time. All exam categories must be showing "good/green" to qualify for our guarantee.